The above quote is from Wendell Berry in his seminal book “The Unsettling of America”, written in 1975. Little did he know that 35 years later his words would sadly ring more true than ever. I have to say though, in the last several weeks I have seen more articles and discussion in the local press about local food and the issues surrounding that awareness than maybe ever before. I am thinking in particular of the News Sentinel’s food writer talking about local farm dinners and the “slow food” movement, political observer Frank Cagle of the Metro Pulse writing of the state government’s unnecessary strictures on small farms in Tennessee, and of the Jefferson County Standard Banner article about the wildly successful Dandridge Farmer’s Market and the teenage vendors there in charge of their own small agricultural enterprises. It makes me think that there truly is a growing awareness of where our food comes from — and of how much potential we have here in East Tennessee to foster and support all kinds of local, sustainable agriculture. Unfortunately, I’ve also been aware of the opposing forces so to speak that are still going strong — especially ones working hard to undo the positive strides being made right here in my community. A year ago this October, the Metro Pulse featured a cover story on the proposed Norfolk Southern development — an intermodal railyard with adjacent industrial park — in New Market, very near where I live in Jefferson County. It is a great piece — letting mostly the residents, many of them farmers, speak for themselves about how they are fighting to protect a way of life and livelihood that would be destroyed if this development takes place. A year later, nothing has drastically changed. Although there are several existing industrial sites in the region that could be rehabilitated to suit such a project, Norfolk Southern has refused to shift its focus from the New Market site — which contains the last significant portion of prime farmland (class 1,2, and 3) in Jefferson County. Not only would folks lose their homes and lands, not only would we be burdened my myriad cases of pollution and health hazards, we would be left with an industrial landscape in place of an agrarian community. The battle continues. In the two years since I have been living back on my family’s farm, I have been inspired and impressed by the farmers in this area who are working hard to create a new reality — one where the small farm is vital again, and where consumers are given the opportunity to choose products that were raised with care and dignity (and by so doing happen to taste much better! ).Â It encourages me to hold myself and and my own endeavors to a higher standard — and keep being part of events and conversations hopefully propelling things forward in the best possible way. 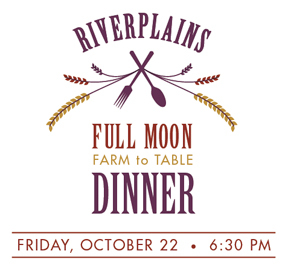 The Full Moon Farm to Table Dinner we are having here at Riverplains in October is to me more than just a social or culinary event — from a certain perspective it serves as political statement, saying to the “opposing forces”: Look, we are thoughtfully celebrating the tradition of food raised and prepared in the most nourishing of ways — no separation of body and soul — and we are doing it right here, in 2010, with other folks who hold these things dear and want to keep them alive! Life has of late kept me out of the kitchen. However Monday’s gray, cool weather got me thinking about cooking again. I have a freezer full of Riverplains beef to use and was researching a party I’m cooking for in a few weeks. I flipped to the index of The Lee Bros. Southern Cookbook to see what they had under beef. Chile con Carne jumped out at me. It seemed the perfect pot of goodness to make for the week. It took a while, there are many steps and 2 hours of cooking but definitely worth it. There were smoky, grassy, and fiery flavors all together. The recipe called for bacon (so I used Benton’s of course), and broiled onions and lots of dried peppers. I ate it over a bed of collard greens and scallions flash cooked in some olive oil. Last night I needed to feed this cold I woke up with and not really wanting to cook, I did something I haven’t done in ages. I boiled some spiral shaped pasta, I really wanted egg noodles but didn’t have any, and tossed them with this AMAZING olive oil and salt. It was so good. I got the olive oil a few weeks ago from Avanti Savoia and hadn’t had a chance to taste it yet. It had so much flavor it was amazing. I have never had olive oil like that before. It is earthy and light and lovely. The perfect cold food. Mockingbird is One Year Old! After one-year of doing business Mockingbird Events would like to thank all of you for your support over the past year. Itâ€™s been quite a year from the Street Food Dinner to Bacon Fest to Farm to Table and a few Speak Easies sprinkled in for good measure. Weâ€™ve had a blast, but none of it would be possible without your support. Thank you! As we enter fall Mockingbird has a full slate of projects on the horizon. On October 22 join us for the Full Moon Farm to Table and soon after that look for the grand opening of the Public House a bar that I am a part of opening. Bacon Fest plans are also in full swing! The mission of Mockingbird Events continues to evolve and embrace the pleasures that grow from the community created by coming together over food and drink. All of our events strive to encompass the glories of a well-executed cocktail, the happiness from a bite of bacon, and the pleasure from dinner under the stars. Thank you for your continued support. Posted in Uncategorized | Comments Off on Mockingbird is One Year Old! The past couple weeks have been pretty hectic. We were rushing to get the bar open by October 1 but then we realized that was insane and not going to happen. But we still had to push for our beer permit, health department, fire, and operation certificates by today. It’s also time to start working on BaconFest 2011. 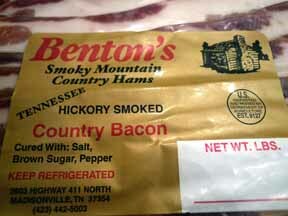 So I got my proposal together and went out to see Allan Benton at Benton’s Country Hams. Back in June he already graciously offered to be the sponsor again, which is fitting since Allan has been the inspiration for bacon parties from the beginning. Through visits to his shop, him being on some panels with my dad, and last year’s BaconFest we’ve become friends. I knew when I called and smiled more than I had in weeks just from a 60 second phone call that the visit was going to be a good one. Now I know I’ve written about visiting Benton’s a number of times but each time is a different kind of visit. This time I noticed the parking lot, for once, was not full of cars. Usually when you go into the little store there are at least 4 or 5 people waiting. The staff has started to recognize me as the person who has the bacon parties so I was greeted accordingly. Always the same 3 or 4 people working, slicing, packing. And Allan was actually in his office instead of the smoke house or helping a customer. So we sat and talked for about a half an hour. It was definitely the highlight of the past few weeks. We talked about pork prices and food in Knoxville. John Fleer and Joseph Lenn. BaconFest came up for a minute or two. I got some really good advice for the Public House. After a half hour or so we went to get my pork rounded up. He always sends me home with a few packs of bacon and prosciutto. I got some stuff for my cousin and friends and then he gave me this big ol’ chunk of 17 month old country ham to serve as prosciutto at the Public House! Probably the best soon-to-be opening gift ever! So stay tuned for more about BaconFest and Public House opening. Tell all your friends! merchants will also be participating, & we’re lining up a food vendor for the event. Lost & Found will be featuring great music from DJ’s Nathan & Kingo Gondo! Fisher Tire will be offering $5.00 off alignments when you mention the event Sept. 25th – 30th. Little Sister’s will be featuring a fresh batch of handmade jewelry, & 10% off incense on Sept. 25th.